The perfect addition to modern decor, this crystal column floor lamp features five glass columns rising from a stacked satin brass finished base to a crisp linen shade with coordinating trim. With two pull chain switches that control the light output. Overall: 62" high. Shade is 19" wide x 12" high. Bottom base is 10 1/2" wide. Weighs 35 lbs. Uses two max 100 watt or equivalent bulbs (not included); twin on-off pull chains. 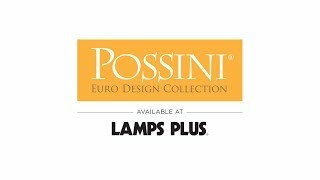 Sleek and tall floor lamp from the Possini Euro Design® brand. Crystal glass column design with metal components. Linen drum shade with coordinating trim. It’s beautiful! I need it! It looks elegant yet, not too fussy. Love the design. I have a dark corner that needs some light. Excited to receive this. Thank you! Perfect for a space between sofa and chair. It also matches another glass lamp and a brushed brass table. Super excited! It's for a client's living room and will be placed next to a baby grand piano. Sophisticated elegance. Crystal and Brass - beautiful combination! because it will go perfectly with my desk. 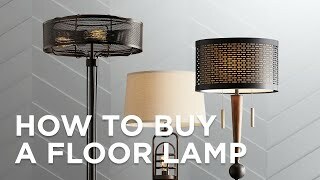 Does this floor lamp have a matching table lamp? What does this lamp weigh ? This is a heavy floor lamp despite its light airy look. what size wattage for this large floor lamp? BEST ANSWER: Hi Mary - this uses two max 100 watt standard/medium base or equivalent light bulbs. Maximum 100 watt each for the 2 bulbs. 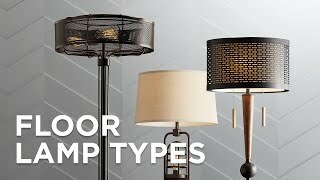 We LOVE, LOVE, LOVE this floor lamp & have gotten lots of compliments on it. You won't be disappointed if you purchase it. What color is the shade? Off white, cream, white, ecru? BEST ANSWER: Hi Kimberly - this includes a white linen lamp shade. would this be too dressy for a game room with a dark gray leather sectional sofa? It would go in the corner behind the sofa which is sad since its so beautiful. Thoughts? It is a very elegant looking floor lamp. Looks great in the living room. It certainly will dress up the game room. If you have any gold trim, like I have a black piano with some gold on the cover, it matches. Good luck! Hello - no it would not be too dressy. (I’m a Decorator ) and this lamp was for a client who had a beachy theme. You can put this into several different room types. Be advised it’s heavy though! I agree I purchased one and placed it out in view, I consider it a "piece " , a beautiful lighting fixture. Go with a chrome it would be better with your sofa. Is the column crystal or plastic? BEST ANSWER: The description says "crystal glass" - it's definitely not plastic. This lamp weighs a ton! It's solid and heavy. Crystal 6 individual columns. This lamp is gorgeous and very heavy! Nothing plastic on it. It I whaat it says, and it does weigh a ton! Can I put a dimmer on this lamp? BEST ANSWER: Yes, you could use a floor dimmer or remote dimmer for this lamp. Click on the images below for more details. i really like this lamp however i don't like the shade...can I change the shade ? BEST ANSWER: Hi - it includes the shade you see already in the box. But, you may purchase another shade under our shade section. Can I have this lamp without the gold trim on the shade? BEST ANSWER: Unfortunately, the gold on the shade cannot be removed. Is there free returns on this lamp? BEST ANSWER: Yes, this lamp qualifies for our free shipping and free returns promotion. You have 60 days to process a return and once you obtain a Return Merchandise Authorization number, we will email you a free return shipping label. Stunning and sophisticated! - Excellent quality and packaging. Glass column is gorgeous and very solid. We purchased two of these for our living room. They give off a lot of light without dominating the room. The design is simple, and the crystal column adds a note of elegance. Looks great in the living room with neutral color sofa! Recommend it! I’m thrilled with the quality and look of this lamp. It’s perfect for my room. The shade was damaged through shipping by UPS and I called Lamps PLus with this information. They sent a new one right away (at no cost to me) which did not get damaged. Customer service is top rate. I recommend Lamps Plus to everyone! This is one of the most beautiful lamps we’ve ever come across. Great quality, solid build. Highly recommend. I highly recommend this beautiful floor lamp. It's perfect with our blend of traditional & modern style. Excellent quality! This lamp is beautiful and will enhance any room. Ours is in the Master Bedroom. From its heavy fluted crystal column to its delicate bight white shade, this floor lamp lights a large space without appearing heavy or bulky. I’ve paired it with a pair of Possini crystal table lamps with black shades, and I love the modern bright look they bring to my quiet historic Chippendale furniture. Beautiful lamp. Would recommend. Sophisticated. This floor lamp is beautiful. Quality item. Base is heavy, provides stability. Shades are prettier in person than expected. I bought 2 for den/ living room which has a lot of wood. Really adds light and elegance to the room! Love the lamp- hopefully next one will come quickly and in time for Thanksgiving ! 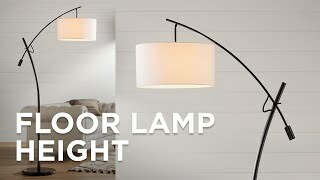 I loved this lamp when I saw it in the catalog. I was so excited when it came Unfortunately when we removed it from the box it was broken. I have shipped it back I will greatly increase my rating if the next one arrives intact!! Hi Sanda C., so sorry to hear your lovely floor lamp arrived broken! Our customer service team is hard at work to make things right for you, but if you have any further questions or concerns, please reach out via phone, email, or chat. Thank you.